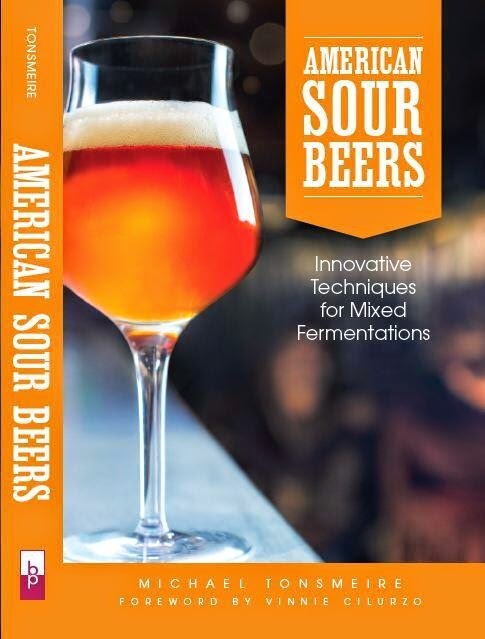 With nearly 100 homebrew recipes posted on The Mad Fermentationist over the last four years it was time to post a guide on how to adjust them for different setups. I post the recipes as they were brewed with the actual volume and efficiency rather than converting them to a consistent format, and I realize that this can be a hassle. Whether you want to brew a batch that is a different volume, your efficiency is different than the recipe, or you brew with extract, this guide will show you how to adjust the recipes to suit your system. Many of these calculations are easy to do with a copy of BeerSmith, ProMash, BeerAlchemy, or one of the dozens of other programs/websites/spreadsheets designed to do recipe calculations. However, I think it's important to develop some instincts on how recipe adjustment works. Fairly frequently I hear someone complain that they accidentally doubled the hops (for example) and didn't realize until it was too late (and the wort was in the fermenter). To convert a recipe to a different volume multiply each of the ingredient (hops, malt, sugars, spices, fruit etc...) by the size of your batch divided by the size of the recipe. For example: if the recipe is designed to produce 5 gallons of wort and you want to brew 10, multiply the weight of each of the malts (adjuncts, sugars, spices, fruit) by 10/5 = 2. For the hop additions rather than doubling the weight of each addition double the amount of alpha acids contributed by each addition. To do this take the weight of each hop addition in the recipe and multiply it by the percent alpha acids called for and the ratio of the batch sizes, then divide by the percent of alpha acids in the hops you are using. If a 5 gallon recipe calls for 1 oz of 5% AA hops and you want to brew 10 gallons with a 4% AA hop the formula would be: (1 oz * 5% AA * 10/5)/4% AA = 2.5 oz of 4% AA hops. The same formula can be used to adjust a recipe for lower/higher AA% hops in the same size batch. Here is an example of scaling a recipe from a four gallon batch to a five gallon batch. Let's assume that the Magnum hops are 12% AA and the Saaz are 4% AA. To adjust a recipes for your efficiency multiply all of the grains/malts by the efficiency listed in the recipe divided by your expected efficiency. You only need to adjust the ingredients in the mash, no changes to other fermentables (such as sugars or fruit) or other recipe parameters such as hops, yeast, or finings. Some sources recommend only scaling the base malt to adjust for efficiency, but if you are extracting fewer sugars from the mash you are also extracting less flavor/dextrins from the specialty malts. Let's look at a recipe that calls for 10 lbs of pale malt and 1 lb of crystal 80 with 70% efficiency. If you are expecting 75% efficiency you'd multiply each of the malts by .70/.75 = .933. So you'd use 10*.933= 9.33 lbs of pale malt and 1*.933=.93 lbs of crystal 80. Here is an example of converting the five gallon recipe above from 70% to 80% efficiency. 0.57 oz. Magnum (Whole 14.50% AA) @ 75 min. 1.00 oz. Czech Saaz (Whole 3.30% AA) @ 5 min. 0.63 Wirlfloc @ 15 min. If you brew relying on malt extract for the bulk of your fermentables you can still make most of the recipes I've posted. To determine the amount of liquid malt extract to use multiply the amount of each base malt by the efficiency of the recipe, if using dry malt extract multiply that number by .84 (this accounts for the more concentrated sugars in DME compared to LME). Make sure to pick an appropriate malt extract(s) (pils, English pale, pale/light, smoked, and/or Munich) to replace the base malt called for by the recipe. Remember that wheat and Munich extracts will replace both the wheat malt or Munich as well as some of the pils/pale in the recipe. In general I recommend against using darker extracts as they tend to be less fermentable, and it is hard to know the proportions of the malts used (or with some manufacturers even what those malts are). Any caramel (including Special B), crystal, roasted malts/grain (roasted barley, Carafa, chocolate, pale chocolate etc...) can be crushed and steeped in the amount listed by the recipe without adjustment. If you are doing a full boil there is not need to adjust the hop additions. If you are doing a partial boil the only hop issue of great concern is that IBUs saturate the wort around 100. So if you end the boil with 2.5 gallons of wort the most bitterness you can have when you dilute the beer to 5 gallons is 50 IBUs (100*2.5/5 = 50). For a long time it was assumed that there was lower hop utilization as the gravity increased, but from what I have read recently this is not the case (namely John Palmer's about face on the issue). I would look at the wheat first since it will contribute to both the wheat and pils. In this case there are no grains that need to be steeped, and there is nothing wrong with that. There are some limits to extract with steeping grains. Many specialty malts like Victory, biscuit, amber, brown, melanoidin, as well as unmalted adjuncts (corn, wheat, rice, rye, and oats) need to mashed with an enzymatic base malt to convert their starches to sugars. Malted grains like rye, wheat, and oats have enough amylase enzyme to self-convert. Partial mashes are relatively easy to accomplish without any special equipment. In fact partial mashes are just like steeping except that you have to put a bit of extra effort into using the right ratio of grain to water (between 1 quart per pound and 2 quarts per pound) and holding the right temperature (~150 F) for at least 30 minutes. To convert an all-grain recipe to partial mash simply use as much grain as you want (making sure there are two pounds of enzymatic malt for every one pound of something else) and then use the method above to convert the remainder of the base malt to extract. You may need to add more extract depending on the efficiency of your partial mash (if you are lazy or don't know your efficiency you can keep extra DME on hand and add more to adjust as needed). Once your mash is complete remove the grains and add the extract and any additional water, continuing with the rest of the recipe as instructed. If you need to make more than one of these adjustments the order doesn't matter, so you can adjust for volume and then efficiency or t'other way round. Hopefully this little tutorial will help give you an idea on how to convert and adjust recipes for your system. If anything wasn't clear, or if I missed your particular situation please send me an email at [email protected] and I'd be happy to update this. Do you have any references for Palmer's about face on hops utilization? Preferably something written as opposed to a podcast. I can't find any "solid" online sources, podcasts seem to be the best resource. Either Basic Brewing Radio or Brew Strong seem to be the best places to go for info on it. Apparently it comes down to the amount of break material, not the gravity, so extract (which has had most of the break removed) doesn’t have the same decrease in utilization that higher gravity beers see. Very useful, for your recipes or any others. Thanks for your work on this. This is really considerate of you and is very helpful info for new brewers- you always go above and beyond to make your information un-intimidating and accessible. Thanks! This is where I really like brewing software (I use Beer Smith) it is super simple to scale a recipe adjust for efficiency, etc. Not positive about all grain to extract (I've been doing all-grain since before BeerSmith) but believe it will do that too. Great post Mike. Part of being a good brewer is understanding how a recipe is put together and how to adjust it for your needs. One other factor I would add to this is knowing your equipment losses. You could lose liquid to deadspaces in the MLT and boil kettle, trub, chillers, etc. If you read a recipe online that calls for a 5 gallon batch into packaging, you may need 5.25 gallons post-boil while the person who posted it needed 6 gallons b/c of deadspace. This is all easily accounted for in brewing software, but it's important to know your system and where to make adjustments. With the hop adjustment; doing it by A.A.% makes sense for bittering hops, but for late additions shouldn't weight be more important as they add less bitterness? for (a worst case) instance, a late cascade addition: 5gal, 1oz 9% AA @ flameout. Adapting for a 10gal batch using 11% AA hops your method gives 1.6oz, which is only 80% of the original hops (in weight per volume). So you get the right bitterness, but i think the flavour may be off. Of course doubling it would probably add too much bitterness. Maybe double the weight of any hops added in the last 20min, and adjust the initial hops to get the right IBUs? It is rare that the same variety of hop will swing that extremely, but point taken. What you are really looking for on late boil additions is to keep the oil addition the same (something that isn’t normally listed on the hops we buy). You certainly could determine the amount of late-boil hops required and then adjust the bittering addition to hold the total IBUs on target. According this article "In summary, it has been established that the ratio of aroma compounds to bittering compounds does fluctuate from year to year. Since hop additions are made based primarily on alpha acid content, different aroma profiles are present depending on the year of harvest." They suggest that if you know the oil content you can tweak the timing of the late boil additions to compensate for variations.